Beloved and I had dinner at Brotzeit some weeks ago. 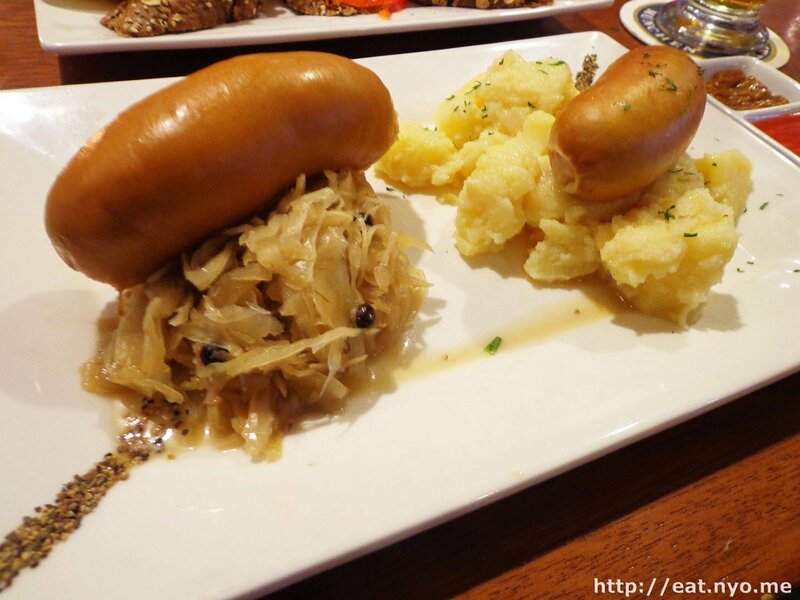 This German bar that serves mostly beer but also food opened its doors at EDSA Shangri-La. This place proved to be a popular watering hole for some of the classier crowd. However, we mostly wanted to go here for their authentic German sausages. We were aware of how expensive the place was going to be which was why we held out for quite a while. Since it was Christmas-slash-bonus season, we finally had funds to feel safe trying out the place, and we did. As we confirmed, most of the people here went for the beer, which they serve a lot of kinds of. Neither Beloved nor I were avid drinkers, and only drank on occasion. And if we did, we usually steered clear of the ale or lagers. 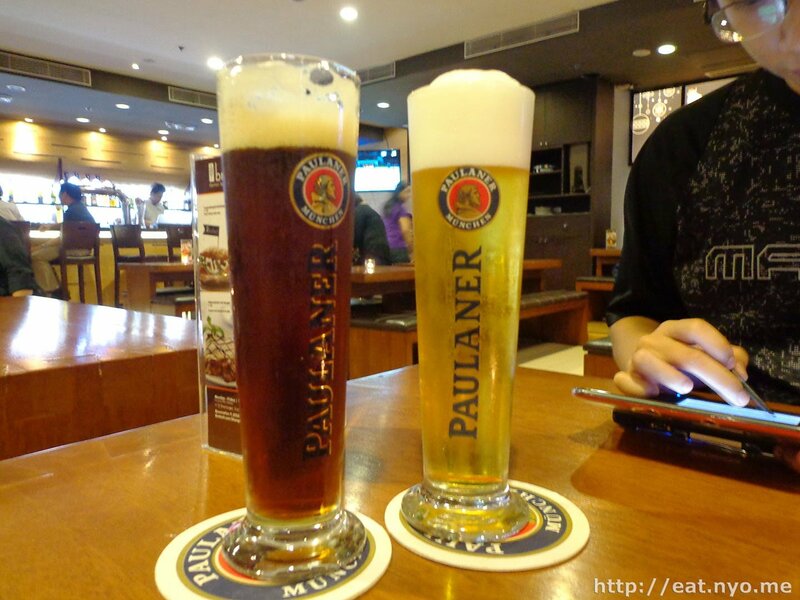 Feeling adventurous, we tried the two opposite ends of perhaps their specialty beer, the Paulaner Lager and Paulaner Dark Lager (200 Php for a 0.3 liter glass each). The former is the brand and the latter is the color-slash-type of beer. I’m no expert, but I can decipher as much. Since, perhaps unlike the rest of the crowd, we went here for the food, we ordered two kinds of their sausages. Beloved had their Currywurst (430 Php) and I had their Bockwurst (430 Php). 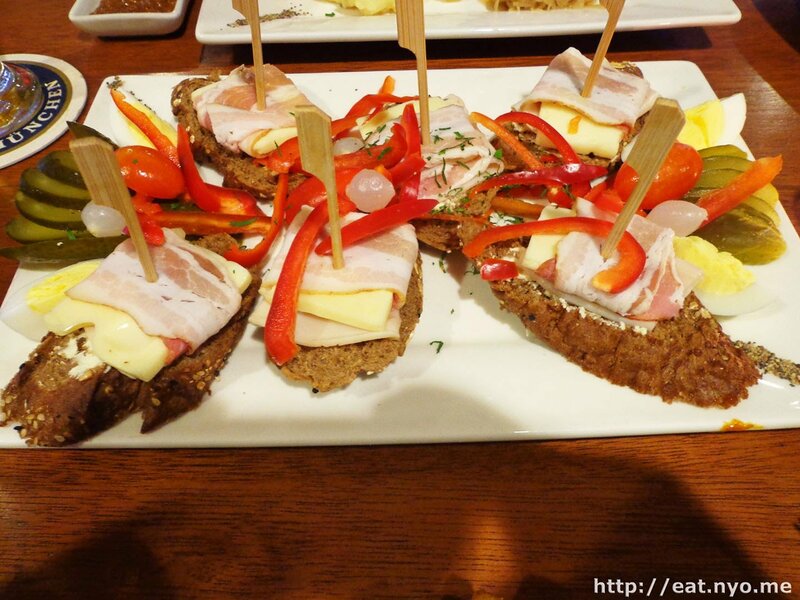 We also ordered an appetizer platter that was called Brotzeit Brot (390 Php), which translates to “Best of Brotzeit”. I’m not really the one to talk hard drinks about. The tall bubbly glass of Paulaner Lager and Paulander Dark Lager were offered before our food. The darker one had a hint of chocolate flavor, but either way, both were wood-bitter. Despite a definite difference, we confirm that we still don’t like the taste of beer. I asked for water after downing half of the glass because my head started to hurt. Our food arrived almost all at once. The Brotzeit Brot, pictured above, was a nice plate of sliced rye topped with stuff. The stuff was basically ham, bacon, and cheese. Scattered over it were peppers, hard boiled eggs, tomatoes, pickles, and a white berry thing that tasted quite sour but had a nice crunch to it. Although it was pretty simple and obviously cold, Beloved and I enjoyed the dish, especially me being fond of pickles. Now for our sausages. Above is the Currywurst. 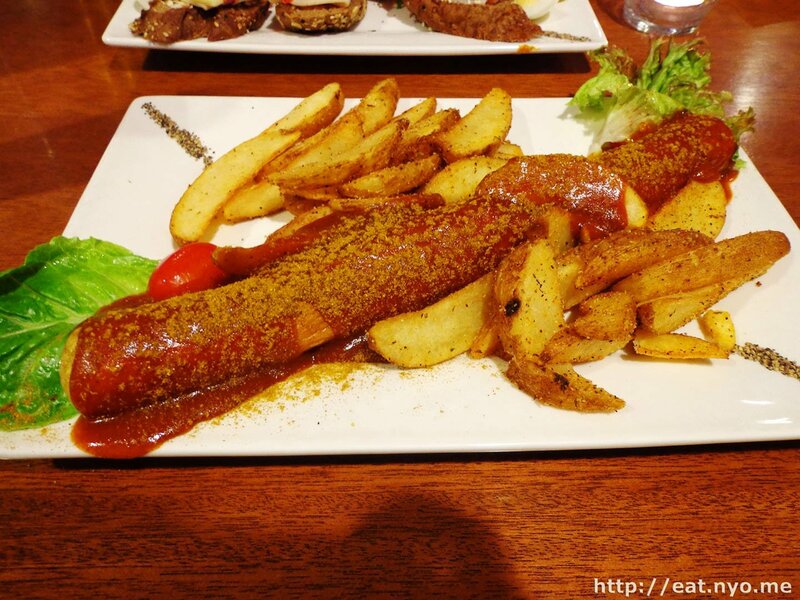 The long and relatively thin sausage, more or less a foot in length, was served with potatoes and covered in sauce and powder that both looks spicy. My limited German knowledge tells me this is a curry sausage, so I expected it to be spicy. Beloved confirms that indeed it was. Both the sauce and sausage itself were spicy. Heck, even the potatoes that were unfortunate enough to get sprinkled with the powder had some punch in them. Luckily, there were few left unscathed which I managed to enjoy the fluffy texture and somewhat crunchy outside. Beloved enjoyed her sausage quite a lot. In comparison to Beloved’s, my Bockwurst was puny in length. However, mine certainly had the bigger girth, and there were two of them. Bockwurst is basically a smoked pork sausage. Underneath my sausages were sauerkraut and mashed potatoes. For those who don’t know, sauerkraut is basically pickled cabbage. I found it surprisingly mild, expecting a strong, sour flavor. As for the potato dish, it was quite chunky, which was nice. The sausages themselves were almost tasteless and mushed strangely as I bit in. It’s required you try out one of the three sauces provided for the dish: one was a slightly sour mustard; another was a tangy, red sauce; and a sort of fruity paste. All of our dishes were cold. I advise against going here if you expect hot food. I also advise not going here if you’re in a strict budget as our bill amounted to almost two thousand pesos. For that price, you can certainly fill yourself up elsewhere. Here, you enjoy the uniqueness of their dishes found almost nowhere else in the Metro when you have little care of the money that comes out your pocket. Nevertheless, their food was quite good and filling. I found it quite nice to enjoy both the strong flavors in the currywurst and the milder ones with the bockwurst. And I guess you go here for the beer, but don’t quote me on that. They also have a platter that they claim is good for five, but looked like the best value order in this place. If you want to try something new and have some cash to spare, Brotzeit might just have what you’re looking for. Smart nomnomnom tip: Beers are cheaper in the afternoon.